This article shows you how to detect when an object has been removed from a user-defined area of interest. With creating a ROI on an Onvif IP Camera video stream you will able to monitor an object and detect when this object removed from this area. It can quickly identify when a particular static item was removed from the scene. If you want to handle take away events, first of all you need to know more about background subtraction what is an image processing technique, with blob recognition and detection to be able to select the desired object. (How to implement object tracking). 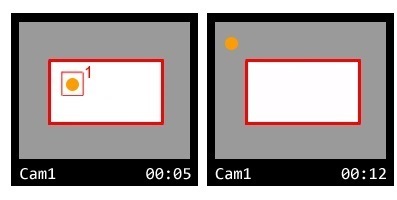 After these steps we will be able to detect an object on the video image. You should set a user-defined area of interest which contains the selected object to observe. Finally we need to check if this object is still in the specified region. When the object steps out the ROI you will be able to indicate it with a take away event and handle the alarm. This behavior is ideal for those who want to detect the removal of high value objects, such as a painting from a wall, a statue from a pedestal, a safe from a bank. It can also be used when reviewing recorded footage, for example of a warehouse or a store room. It is recommened to ignore moving foreground objects.